Consistent 80% Giving Marks the Leadership of our Agents and the Loyalty of the Class. An astounding but not surprising eighty-three percent (83%) of the Class of 1970 contributed to the 2017-’18 Alumni Fund Campaign, winning two outstanding trophies for the class. The Class has been giving at above the 80% level consistently for the last eighteen years since 2001. To the class in the youngest 50 with the highest participation rate. 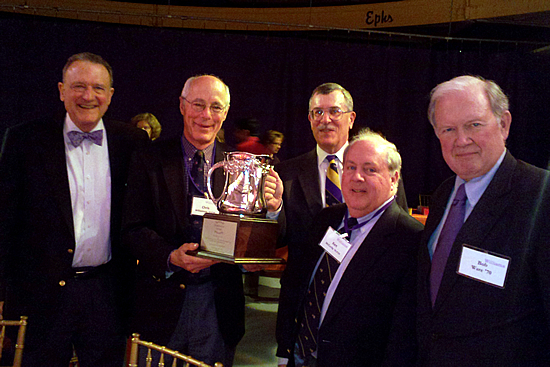 Special trophy between the Classes of ’65 and ’70 established two years ago. Formula for participation, dollar amount. To honor outstanding Class Agents of the Classes of ’65 and ’70. The Class of ’70 has been giving at above the 80% level for many years now. Eighty three percent (83%) of you are coming to reunion! Think of it! We old sods had a higher participation level than all younger classes! The Class of ’65 was the closest competitor, coming in right around 80%. That’s a tad fewer than 9 givers making the difference for us. We had 37 donors in the last 10 days of the campaign. That’s 12.8% of our class. Our thanks go out to every donor – but especially this year to those of you who were so considerate in responding to our late requests. You make a great difference!